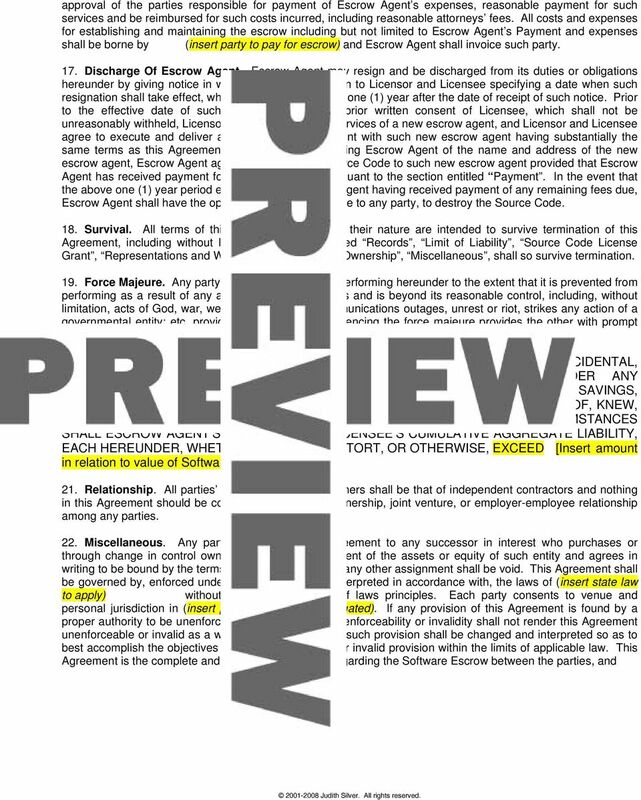 Download "SOFTWARE ESCROW AGREEMENT. 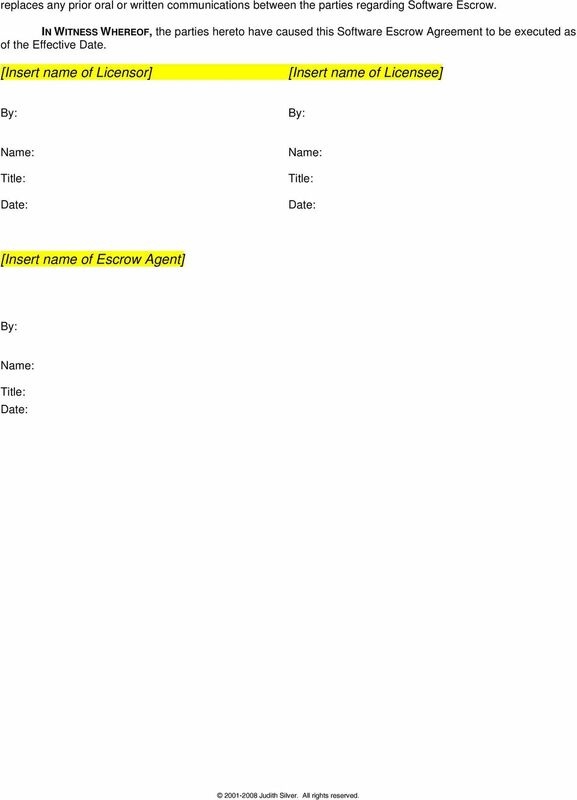 ( Effective Date ), this Software Escrow Agreement ( Agreement ) is"
2 inspection rights hereunder. Access to the Source Code shall be permitted to authorized representatives of Escrow Agent to the extent necessary for Escrow Agent to perform its obligations pursuant to this Agreement. 6. Records. Escrow Agent agrees to keep complete written records of the activities undertaken and materials prepared and delivered to Escrow Agent pursuant to this Agreement. Licensor and Licensee shall be entitled at reasonable times, during normal business hours and upon reasonable notice to Escrow Agent during the term of this Agreement, to inspect the records of Escrow Agent with respect to the Source Code. Licensor shall be entitled upon reasonable notice to Escrow Agent and during normal business hours to inspect the facilities of Escrow Agent with respect to the physical status and condition of the Source Code. 7. Term. This Agreement shall remain in effect so long as the License Agreement is in effect. Upon expiration of this Agreement, the portion, if any, of the Source Code not previously withdrawn by Licensee in accordance with the terms, shall be redelivered to Licensor and this Agreement shall thereupon terminate. 8. Default By Licensor. The following shall constitute an event of default by Licensor which give Licensee the right to receive the Source Code for the Software from the Escrow Agent pursuant to the section entitled Delivery of Source Code to Licensee : (pick applicable defaults from list) a. Licensor ceases doing business and its business is not continued by another corporation or entity or is continued by another corporation or entity which Licensee for reasonably cause deems unsatisfactory; or b. Licensor becomes insolvent or a party to any bankruptcy or receivership proceeding or makes an assignment for the benefit of creditors; c. Licensor is in material breach of the License Agreement; or d. Licensor is in material breach of its maintenance obligations in the License Agreement. 9. Delivery Of Source Code To Licensee. a. Upon the occurrence of one or more of the default events defined in the section herein entitled Default by Licensor, Escrow Agent agrees and is hereby specifically authorized to provide the Source Code for Software to Licensee upon written request by Licensee as outlined in this section. Prior to delivery of the relevant Source Code, (a) Licensee must have given written notice to Escrow Agent of the occurrence of default by Licensor, which notice shall specify the nature of the default; (b) Escrow Agent must have within five (5) business days transmitted a copy of the Licensee notice to Licensor; and (c) within twenty (20) days after receipt of the Licensee notice from Escrow Agent, Licensor must have failed to notify Escrow Agent in writing that Licensor disputes Licensee s notice. b. If Licensor disputes Licensee s notice of default, then within thirty (30) days subsequent to Licensee s notice, Licensor must file written documentation with Escrow Agent, with a copy to Licensee, by an authorized representative of Licensor stating that no such default has occurred or that the default has been cured. 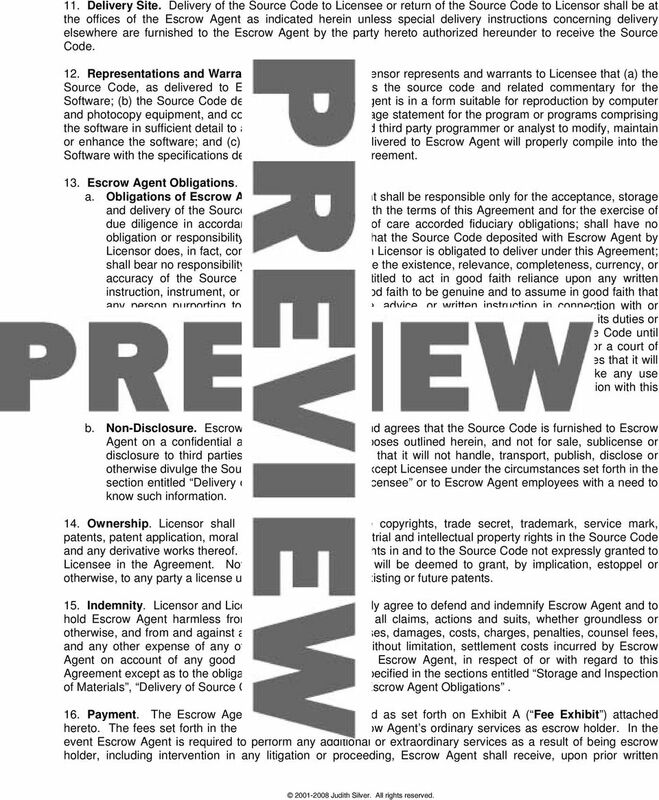 If Licensor fails to file such documentation, then Escrow Agent shall deliver the relevant Source Code in accordance with the instructions of Licensee. 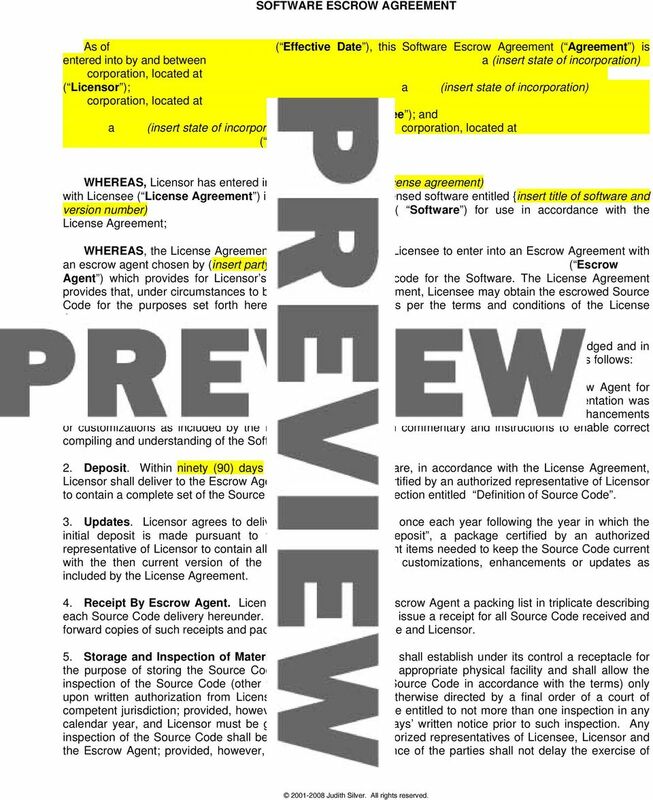 If Licensor delivers written documentation disputing Licensee s claim that a default has occurred, then Escrow Agent shall not deliver the Source Code to any Licensee or Licensor until directed to do so by Licensor and Licensee jointly or by an arbitrator, or until Escrow Agent is ordered to do so by a final order of a court of competent jurisdiction, and upon such delivery this Agreement shall terminate with respect to the Source Code so delivered. 10. Source Code License Grant. a. License Grant for Use of Source Code. If the Source Code is released to Licensee pursuant to the section entitled Delivery of Source Code to Licensee, Licensor hereby grants Licensee the right to use, access, perform, display, copy, distribute and create derivative works from the Source Code for internal use in accordance with the terms and conditions of the License Agreement. b. Non-Disclosure. 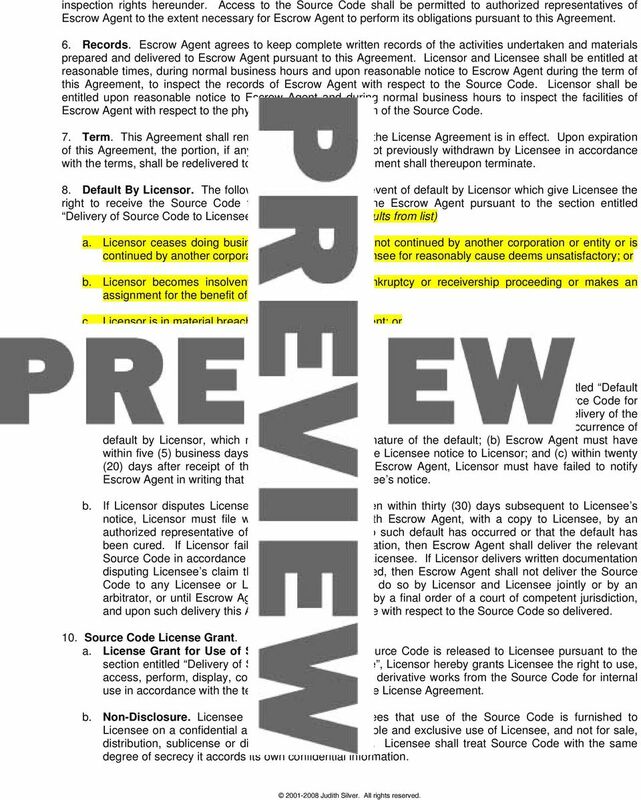 Licensee acknowledges and agrees that use of the Source Code is furnished to Licensee on a confidential and secret basis for the sole and exclusive use of Licensee, and not for sale, distribution, sublicense or disclosure to third parties. Licensee shall treat Source Code with the same degree of secrecy it accords its own confidential information.